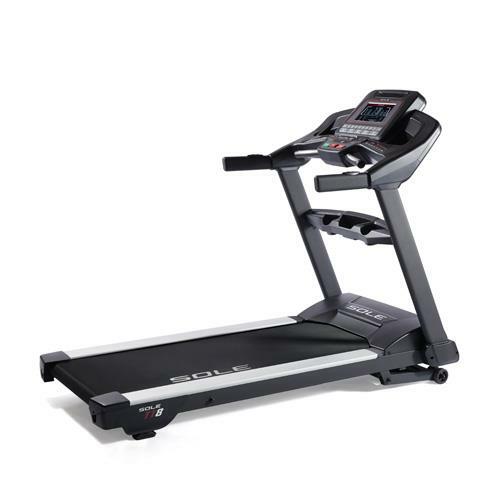 The Sole S73 non-folding treadmill is an upscale model from Sole Fitness, a leader in the manufacture of sturdy machines designed for heavy at-home use. It lists at $2300, but you can usually find it on sale for $1800. If you buy it online, you get tax and shipping waived, which can save you $200-$300. The Sole S73 non-folding treadmill has a 3.75 hp continuous duty motor and ten programs, including two custom and two heart rate programs. It has a generous running surface and a console that tracks speed, incline, distance, time, calories burned, pulse rate and pace. 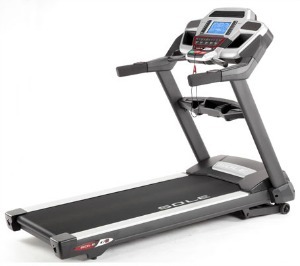 UPDATE: The S73 treadmill is no longer being sold, recently replaced by the all new Sole S77 model. Check out this upgraded model for specs and information. Enthusiasts who have always admired the Sole S73 non-folding treadmill for its stability, quiet, smooth ride and dependability are giving positive feedback in reviews for the upgrades in the 2013 model. It now has a weight capacity of 400 pounds and the belt is two inches wider, all of which mean owners are getting an even smoother ride. The motor is an impressive 3.75 hp continuous duty; combined with the incline that adjusts up to 15%, you're getting lots of power and a great workout range for casual users as well as serious athletes. The 7.5" LCD console display and arm rest speed/incline control are also frequently mentioned as selling features. Sole always offers machines that can stand the test of time and take a genuine beating from multiple users. As with most Sole treadmills, the flywheel has some heft to it, which helps the motor run cooler. They've increased the horsepower of the motor and made the running surface two inches wider, making the Sole S73 non-folding treadmill one of the best you'll find if you like a solid machine with a nice range of programs without lots of extras. You won't find dozens of programs or an entertainment center built in, but you'll get an outstanding workout. Keep in mind, however, that the Sole S73 is a non-folding machine and it is generously sized at 57"x 83"x 37", so you'll need to make some room for this model. Most popular Sole treadmills are on sale right now!